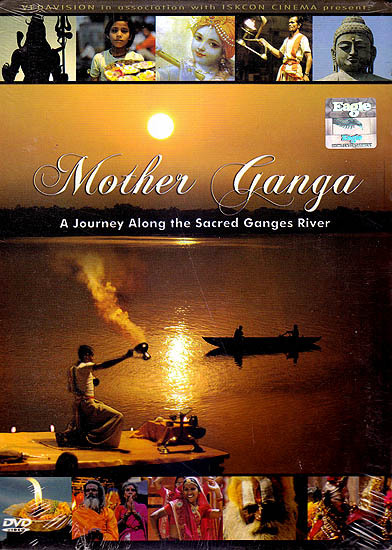 Mother Ganga is a stunningly beautiful documentary on India’s greatest river the holy Ganges. Join a spiritual journey that begins at Ganga sagar on the Bay of Bengal where Ganga enters the sea and ends 1600 miles later at Gomukh high in the Himalayan Mountains where she appears. Along the way visit the holy sites of Mayapur where Lord Caitanya appeared and Bodhgaya Lord Buddha’s place of enlightenment. Witness the beautiful Ganga Puja worship performed to her golden waters at Benares and the world’s largest fair the Kumbha Mela at Prayag. Be amazed by the austerities of mystic yogis in Rishikesh and finally ascend the towering peaks of the mighty Himalayas to discover Ganga’s mysterious source. Throughout we hear timeless narratives from the ancient Vedas Describing Ganga’s spiritual origin and the superhuman pastimes of India’s saints demigods and heroes. State of the art special effects and animation artistically enhance the images giving us a glimpse into the transcendent nature of Ganga. Ganga is a river insparably bound to India’s culture and religion a river worshipped by a billion people as a mother who sustains life and cleanses sins. Dive deeply allow your hart to be carried away by the waters of Mother Ganga.